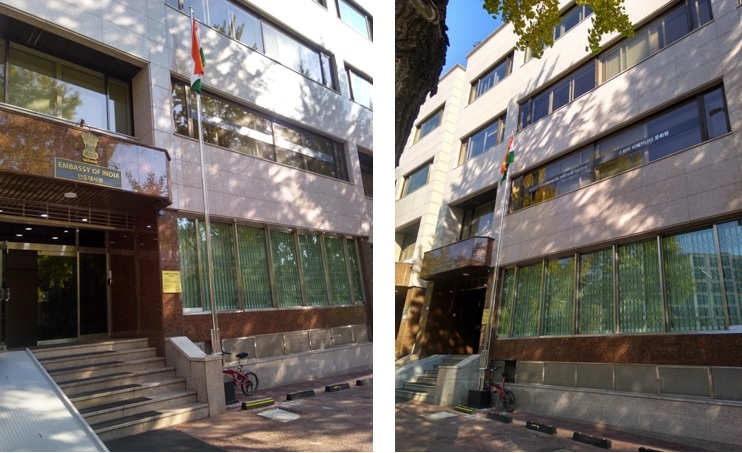 Fulfilling a long-held desire to provide a platform to showcase India’s rich cultural heritage and serve as the nodal point for cultural exchanges between India and the Republic of Korea, Swami Vivekananda Cultural Centre (SVCC) was established in 1 July 2011 at the heart of Seoul, Hannam-dong. Since its inception, SVCC has been providing regular classes on Yoga, Indian Classical dance Kathak, contemporary dance and Hindi language. The centre also organises special lectures on diverse aspects of Indian culture by involving renowned Korean scholars and academia. Leveraging local talents on Indian culture, the centre has successfully introduced odissi and tabla classes at its premises in addition to other Indian art forms and languages as and when available. The centre has also expanded the scope of culture promotion by organising Indian cooking classes in association with culinary institutes in Seoul; screening Indian movies both at its premises and at public places such as libraries, movie halls and parks; and introducing Indian games such as carrom in Korea. Further, as part of its ‘Outreach Programme’, SVCC opens its premises to schools, universities, associations and other entities interested in understanding Indian culture and provides them a wholistic perspective of India and its culture. In addition, SVCC conducts ‘Outreach Programes’ across Korea with an aim to reach out and introduce India to people living away from Seoul. The centre has also established a wide range of contacts and entered into Memorandum of Understandings with several provinces, cultural organisations and academic institutions intending to broaden the stakeholders promoting Indian culture in Korea. SVCC also offers its premises to artists, academics, writers and performers from both India and Korea for showcasing their talents and reach out to a wide and discerning audience. As part of its cultural promotions, SVCC has been organising several events in Korea and notable includes ‘International Day of Yoga’, ‘Tagore Jayanthi’, ‘Gandhi Jayanthi’, and ‘Festival of India in Korea – SARANG’ every year. SARANG which means “Love” in Korean has been organized by SVCC for last 4 years and has now become a significant annual cultural festival of Korea. Through SARANG, SVCC introduces diverse Indian arts forms such as dance, music, yoga, Indian films, cuisine, arts and academic works for a ten day period in different parts of Korea in association with local hosts and organisations. Recently in July 2018, SVCC relocated to a new premises (just across Embassy of India), which offers a larger and separate space for performances and events. The centre is headed by a Director (currently vacant) and supported by Programme Officer and two staff members. ICCR has also deputed a Teacher for Indian Culture and Dance teacher who conducts yoga and Kathak classes respectively at the centre. In addition to SVCC, there is another Indian Culture Centre in Busan, which is one of the two Public Private Partnership modeled ICCs functioning abroad. 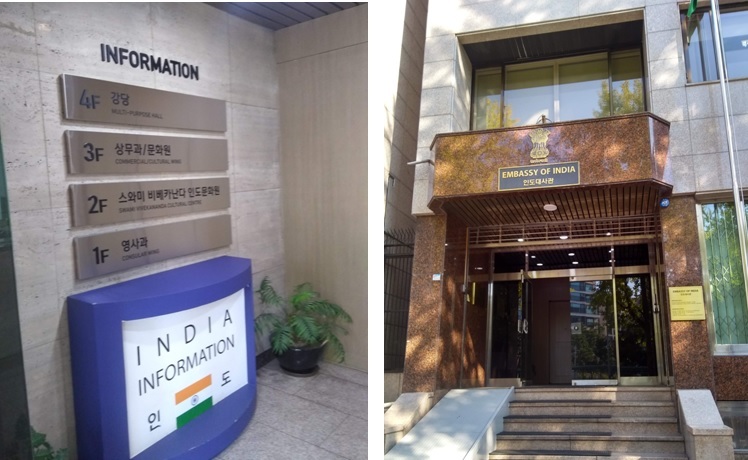 With part support from ICCR, including deputation of a Teacher for Indian Culture and Dance teacher, the Indian Culture Centre in Busan has been promoting Indian culture and undertake outreach activities in Busan and southern parts of Korea. The centre is headed by a Director, who is also the Honorary Consul General of India in Busan, and supported by two local staffs. 인도의 풍부한문화 유산을 선보이고자 인도와 한국 사이의 문화 교류의 발판이 되고자 스와미 비베카난다 인도문화원은 2011년 7월 1일 서울의 중심부, 한남동에 설립되었습니다. 인도문화원은 설립 이래 요가, 인도 고전 무용, 현대 무용, 힌디어 정규 강좌를 제공하고 있습니다. 또한 저명한 한국 학자, 학술가들과 함께 인도 문화의 다양한 측면을 소개하는 특별 강연을 개설하고 있습니다. 인도 현지 인재와 함께 하는 오디시(Odissi)와 타블라(Tabla) 수업, 그리고 인도 예술 형태 및 언어 등을 성공적으로 소개하는 장입니다. 인도문화원은 서울의 요리 학원과 연계하여 진행되는 인도 요리 강좌, 본 원 및 도서관, 영화관, 공원 등 여러 공공 장소에서의 인도 영화 상영회, 인도 스포츠의 한 종류인 까롬(Carrom)을 소개하는 등 다양한 프로그램을 통해 문화 진흥의 범위를 넓히고 있습니다. 나아가, 'Outreach Program (방문 프로그램)'의 일환으로 인도 문화 체험에 관심이 있는 학교, 대학, 협회 및 기타 단체에 직접 방문하여, 인도와 인도 문화의 면모를 선보이고 있습니다.인도문화원은 서울 외 지역에 거주하는 사람들도 인도 문화를 접할 수 있도록 국내 전역에 걸쳐 'Outreach Programmes (아웃리치: 방문 프로그램)'을 시행하고 있습니다. 인도문화원은 한국에서 인도 문화를 홍보하는 이해관계자 구축망을 넓히려는 몇몇 지방, 문화 단체, 학술 기관들과 광범위한 접점을 구축하고, 양해 각서(MOU)를 체결하고 있습니다. 인도문화원은 인도와 한국의 예술가, 학자, 작가 및 공연자 분들이 그들의 재능을 선보이고, 보다 폭 넓은 범위의 청중들에게 다가갈 수 있는 장소를 제공합니다. 인도문화원은 문화 진흥의 일환으로 한국에서 여러 행사를 개최하고 있으며 매년 '세계 요가의 날', '타고르 기념일 (Tagore Jayanti)', '간디 자얀티(Gandhi Jayanti)', '사랑-인도 문화 축제'를 개최하고 있습니다. 지난 4년 간 한국말로 ‘사랑’이라는 의미의 ‘사랑-인도 문화 축제’를 주관해 왔으며, 현재 한국의 중요한 연례 문화 축제로 자리 잡았습니다. 인도문화원은 ‘사랑-인도 문화 축제’를 통해 국내 주최자 및 단체와 연계해 10일 여간 국내 각지에서 무용, 음악, 요가, 인도 영화, 요리, 예술, 학술 작품 등 다양한 형태의 인도 예술을 선보이고 있습니다. 최근 2018년 7월, 인도문화원은 보다 원활한 공연과 행사 진행을 위해, 더 넓고 독립된 공간을 제공하는 새로운 건물로 이전하였습니다. 문화원 원장(현재 공석)을 주축으로 프로그램 기획관과 직원 2명, 인도문화교류부에서 파견된 요가, 까탁 수업을 진행하는 선생님들로 구성되어 있습니다. 이 외에도, 해외의 인도문화원을 모델링 한 정부-민간 합작 기관 중 한 곳인 인도문화원이 부산에도 위치해 있습니다. 인도문화교류부의 지원을 받고 있는 부산인도문화원은 인도 문화를 홍보하고 부산 및 한국의 남부 지역에서 활동하고 있으며, 주한인도명예총영사와 두 명의 현지 직원으로 구성되어 있습니다.